Whether performance street, drag or road racing, Pelican Parts offers a SPEC Clutch Kit just for your Porsche, BMW, VW and Audi. There are several Stages of clutch kits with different materials to choose from depending on how much clamping pressure you need. You can depend on SPEC to perform each time you hit the street or track. Enter Promo code SPEC5 at Checkout for savings! 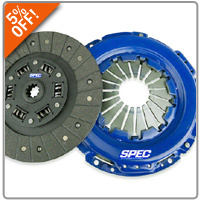 Click HERE for SPEC Clutch Kits!